Update: The actual location of the building in this image is unknown. What do the top ten cities (over 250,000 population) with the highest poverty rate all have in common? Detroit, MI (1st) hasn’t elected a Republican mayor since 1961. Buffalo, NY (2nd) hasn’t elected a Republican mayor since 1954. Cincinnati, OH (3rd) hasn’t elected a Republican mayor since 1984. Cleveland, OH (4th) hasn’t elected a Republican mayor since 1989. Miami, FL (5th) has never had a Republican mayor. St. Louis, MO (6th) hasn’t elected a Republican mayor since 1949. El Paso, TX (7th) has never had a Republican mayor. Milwaukee, WI (8th) hasn’t elected a Republican mayor since 1908. Philadelphia, PA (9th) hasn’t elected a Republican mayor since 1952. Newark, NJ (10th) hasn’t elected a Republican mayor since 1907. Could this be an example of Einstein’s definition of insanity? While the name of the individual who compiled this information is unknown, data is easily verified at City-Data.com and the Census Bureau. How many of them are ” sanctuary ” cities , should be the first issue? Then, what % of them are using “programs” of assorted “assistance” benefits for the working ages of 18-50 ? This picture is not from the United States. 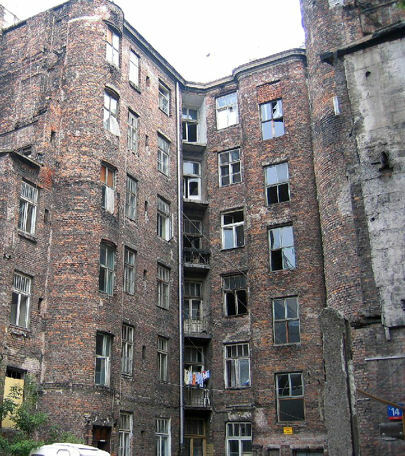 It is from Warsaw, Poland, in the old Warsaw ghetto. Michael, thanks for bringing it to our attention.